Fractions is one of the most challenging topics in math. Here’s an approach to help introduce fractions. I show the photo above, explain to a student that he and I both paid for the pizza. We are going to finish eating the pizza and I get the slice on the left. 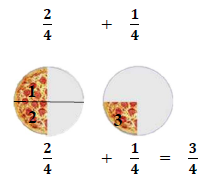 I ask “is this fair?” This leads into a discussion about the size of the slices and what 1/2 and 1/4 mean. The pizza on the left was originally cut into 2 slices so the SIZE of the slices is halves. 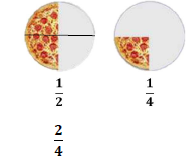 The SIZE of the slices in the one on the right is fourths. I have 1 slice left and it is a half so my pizza is 1 half or 1/2. He has 1 slice left and it is a fourth so his pizza is 1/4. The bottom number is the size and the top number is the # of slices. We cannot count the number of slices because they are not the same size. So we need to change my pizza. So I slice my pizza and now I have 2 slices and they are cut into fourths. So now I have 2/4. Note: I don’t show the actual multiplication to show how I got the 2 and 4. I am sticking with the visual approach to develop meaning before showing the “mathy” approach.